This post is continued from If Plants Can’t Think, How Do They Develop Such Beautiful Habits? from last month. It’s a great time to be a plant, a hard time to be a gardener–or an elementary school teacher, as it happens. Both plants and children grow wild in the spring. Weedy, fast, invasive of places they should not be. My sons’ kindergarten teacher begins expecting this wildness at about the same time that maple syruping begins in February. She catches one child, who has always kept out of mischief, putting a slush-chunk down the back of a friend’s jacket. The formerly mischievous child may become an evil genius, luring the rest of the class onto the roof up a ladder built from fallen tree-limbs and saved twine. “The sap is rising,” she says simply. Last month’s post on Thinking Like a Plant by Craig Holdrege, described the ways in which the habits of plants offer useful analogies to human habits, particularly those of children. This month offers two examples of how beautiful a plant’s abnormal or less-than-symmetrical habits can be. Here’s hoping that meditating on life’s beautiful aberrations offers readers a fresh perspective on gardens and children gone weedy with spring. During the second half of Holdrege’s presentation, we looked at slides depicting wild radishes. Several plants grew within twenty feet of each other into very different sizes, though they were the same age. The smallest, barely as long as an adult index finger from root-tip to budding flower, had struggled up at a building site through packed dirt frequently trafficked by heavy trucks and workboots. At the edge of the adjoining meadow, the tallest radish flourished to hip-height: Paul Bunyan in proportion to Tinker Bell. This lumberjack radish had plentiful sun and moisture, earth nicely balanced and drained. 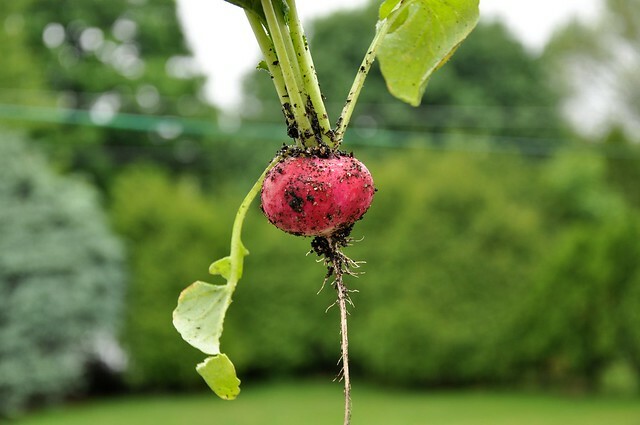 The rest of the radishes, spaced between the two extremes, were in-between in every way. But we could not truly call the smallest plant stunted. Its habit was perfect, remarkably similar to its siblings’. Slender and delicate, the radish growing in hardship still showed perfect proportions, complete leaves and flowers, exquisite tiny flowers that might make you believe in fairies. The lumberjack radish, while permitted to spread to its fullest size, was identical in proportion, in flower and leaf color and shape, no more perfect than the one that struggled hardest. Stunted? That tiny radish didn’t even know it was challenged. It transcended its dismal environment, a poem of photosynthesis. A second slide depicted drawings of several truly deformed, leafless trees. The trees were alive and healthy, Holdrege assured us. They were leafless because they were depicted during the winter, in order to better examine their habits [see images at natureinstitute.org/pub/ic/ic14/trees.htm]. Two were tall, reedy, their crowns narrow, disproportionately formed, as if a thoughtless pruner, wanting some of the branches out of his way, whacked them off close to the trunk, not caring whether the tree fell over as a result. Another seemed stunted in addition to being deformed. A fourth appeared lobotomized, or the victim of an enormous tree-grazer, its otherwise full crown missing a half-moon hunk at the top. The fifth was almost symmetrical, except for a long limb that it stretched into nowhere, as if it were evolving a clam’s foot. We compared the odd-looking trees to one with a more iconic appearance, with a stout, sturdy trunk, spreading limbs, a nicely rounded crown. Holdrege, while displaying this slide, lectured on learning abnormalities. Methods of dealing with children’s developmental issues can involve a lot of isolation from social interaction. The therapist may spend a lot of time with the child out of context. In the final slide, the abnormal trees were depicted in their natural states. The reedy trees grew alongside others, their crowns no longer appearing off-balance, because they complemented each other. One of them sheltered the stunted tree under its lower limbs. The tree with a bite taken out of its crown accommodated another tree, as well, and the last laced a long limb through the branches of a companion. When looked at in their natural states, the formerly abnormal trees revealed themselves as a forest. And the “perfect” tree? It grew in the middle of a field, alone. Does a forest’s wild, natural, and beautiful habit imply that children growing in different ways be left to work things out for themselves? Does the perfection of a plant growing under stress suggest that stress is good for children? I for one don’t believe so. Even if we’d like to extend the forest analogy to reflect ideas about human community, I’d like to imagine that the success of human culture is based more on “cultivation” than “natural selection”. (Comments from readers on my optimism are welcome.) But meditating on the forest’s individuals and their beautiful oddness does offer some wisdom. The lone tree may be perfect, but it is an anomaly, and humans, too, grow up far more often in community. At the very least, when observing oddness in ourselves or in our children, the habits of stressed plants remind us to view oddness as the uniqueness of individuals growing to complement each other. Photo by Jeremy Bronson, via Flickr.